I am working class; my people don’t get ahead in life. If I try to do something different I will be a target. Who knows for sure? But, I’m sure you could come up with a few more. What would Bob’s life look like if he were to challenge those limiting beliefs and reach out for success and wealth as he stepped up confidently into his own business? Why his whole world would change! His children’s and his wife’s world would be vastly different. Do you think he would be happier? How about Scrooge’s nephew? If ever there was a fellow who believed in and lived by the Law of Attraction, it was Fred. He gave his support and kindness freely. He did not believe that wealth was something to hoard or hold onto. He lived as if he would always be the benefactor of the Universe’s riches and he always was. His family, his home, his business and his circle of friends benefited from his generous nature and his unwavering belief that he and his fellow man were deserving of good things. Then there is Scrooge, the founding father of the “War Chest Hoarder Movement.” To him, wealth was meant to be hoarded at all expense, even that of himself and his fellow man. Wealth was a weapon in his arsenal. He built his wealth with greed and paranoia, amassing a pile of money that NO ONE was going to enjoy, not even him. What kind of mindset would someone have to have to have such a miserable and miserly existence? What limiting beliefs does he have? Perhaps he does not trust that money will come to him because he has seen people lose everything. Maybe he is in rebellion against his father and not able to be kind because he did not experience kindness. Perhaps he does not feel worthy, so he cannot allow himself to let his guard down and enjoy his wealth. Again, I’m sure you can think of more possibilities. I have heard this story a thousand times. I have watched this movie over and over, in many different versions How did I fail to see the message in them? Easy. I did not know I should be looking for them. Just like my clients, they earn, spend and negotiate their money millions of times, but they fail to see the messages in their patterns. Which brings me to my job. Yes, you guessed it. I get to play the Spirits in this story. I am the Spirit of Christmas Past. I help my clients uncover their money story of limiting beliefs that accumulated around their mindset about wealth and success. I am the Spirit of Christmas Present. I help my clients look at their current situation and help them to see things differently. I am the Spirit of Christmas Future. I help my clients reveal the true cost to their future if they do not change their ways. I help them see what is possible and what is inevitable so that they have a choice. So that they can change their life too. Sounds dramatic, doesn’t it? Who knew that you could get so much good stuff from Scrooge? I know I am shocked, too. However, take a moment and think to yourself: Who am I in this story? How could my life change if I took a good look at my Mindset around Money and revealed and released any of that junky energy that may be lingering there? What is the cost to me if I don’t? If you feel that you need a visit from the Spirits of Christmas Past, Present, and Future, I invite you to contact me by clicking here for a free Discovery Session. We’ll travel back to your past where money stories took hold. We’ll swing into the future to see where, if left unchanged, they will lead you. And, more importantly, together we’ll become more present to your current money story and explore your options to change or shift your Money Story. 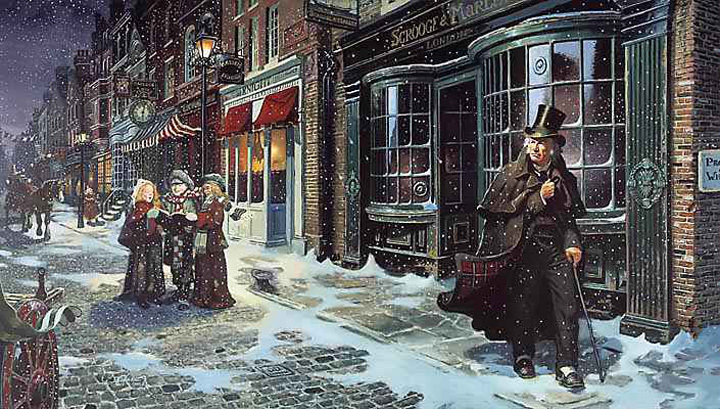 After all, even Scrooge saw his way clear to a brighter tomorrow. I would love to your thoughts on how you see “A Christmas Carol” in this new light, and would love if you would comment below. Thanks Caroline…it is funny how you see things in a different light when you look deeper.